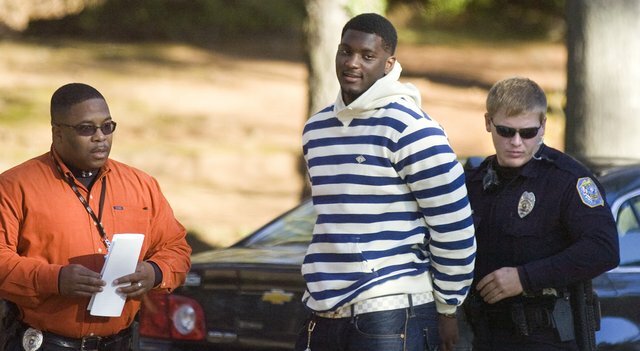 Rolando McClain may have run out of second chances, at least as far as the NFL is concerned. On Sunday night, McClain was arrested in Decatur, Georgia for disorderly conduct and resisting arrest. The arrest makes a hat trick for McClain in his hometown, as it’s his third since 2011. Witnesses claim that police ordered McClain and others to disperse, as a large crowd had gathered in Pines Park, when the former Raider linebacker refused to leave and cursed out the officers. McClain was then handcuffed, arrested, and released on bail shortly thereafter. McClain had been languishing in free agency until the Ravens signed eventually signed him to a $700,000 contract, of which none was guaranteed, thankfully. What I can almost guarantee is that he will be released from said contract in the very near future. Character issues have followed the young man ever since his days as a standout player in Alabama, and it would do McClain well to make a change of scenery from the town, or rather the undesirable company, that has influenced his irresponsible behavior during so many trips home. I’m not sure McClain will get another shot, should he get cut. Editors Note: He may end up either shot or cut/shanked. He’s only 23, and not short on talent, but McClain’s immaturity has done him more harm than good. I doubt another team has the patience to baby-sit a proven malcontent who isn’t a superstar i.e., Dez Bryant. And while McClain’s NFL future is an important issue, his future well-being is of greater concern. Hopefully, someone can step in and give McClain the guidance he needs to avoid becoming a statistic in an ever-expanding prison enterprise.